Cooler Master's new Cosmos is out of this world. A high-end tower with a high-end price to match. After Cooler Master's coveted Cosmos II hit the market, we found ourselves waiting five long years to see the next iteration of the Cosmos. Lucky for us, It turned out to be well worth the wait as the Cosmos C700P blew us away to quickly become one of our favorite full sized towers. Now we've been given another treat as Cooler Master is already unleashing the new and improved C700M. From our first glance at Computex earlier this year, we could tell the C700M represents the peak of Cooler Master's evolving design philosophy. The company's signature logo is noticeably absent from the case. Instead, all that remains is a familiar hexagonal shape used as a power button. We've already seen this shift with some of Cooler Master's recent cases and liquid coolers, but the C700M really seals the deal with its sleek lines and artfully crafted top ventilation. We were already impressed with the tasteful RGB lighting from its predecessor but the C700M really kicks it up a notch. The lightning now features individually addressable RGB strips that form a continuous line from the back of the top panel all the way through the bottom of the case. Metallic contacts allow you to easily remove the front panel without having to worry about wires. A fresh matte design on the case's signature handlebars allow the understated lighting to really accent its curves. Another subtle difference from its predecessor, the C700M features a lighter tint on the window making it easier for you to show off your build. Aesthetic improvements aside, the new Cosmos also introduces a host of improvements in the interior that any builder can appreciate. The case features an incredibly modular layout that allows you to choose between a conventional, inverted or chimney style motherboard tray. One of the favorite things we experienced while building in the case is the fact that we were able to remove the motherboard tray and assemble a majority of our system outside of the case. Built in cable routing, cable management clips and a modular cable cover system also makes it easy to create a very clean system. The ability to switch between a conventional layout and an inverted one is not uncommon for a high end full tower. What really sets the C700P and C700M apart from the competition is the ability to rotate the motherboard 90 degrees into what Cooler Master calls its chimney layout. This type of layout allows hot air to follow its natural trajectory and efficiently exhaust from the top of the case. Unique to the C700M is a graphics card mounting bracket and included riser cable that allows you to mount your GPU horizontally or vertically in multiple positions. You can even angle the card to show off a custom waterblock or RGB lit blower cooler. Our testing proved Cooler Master's chimney layout with a vertically mounted GPU to be the most effective for cooling the system, but the difference between the conventional layout would be negligible for most users. Our only complaint about these alternative motherboard configurations is the fact that it becomes quite a hassle to access the rear I/O. Depending on your desk size, you might even need extension cables for your peripherals. 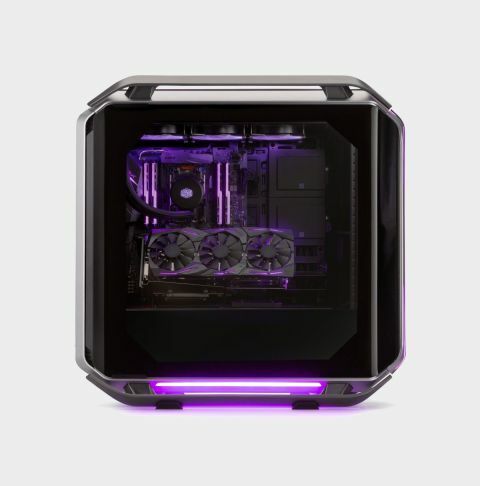 Regardless, the modularity and freedom to customize the C700M is totally in line with Cooler Master's "Make It Yours" philosophy that enthusiasts have come to love. As expected of a Cosmos case, the C700M represents the pinnacle of Cooler Master's innovation in the space. It's a highly versatile flagship that supports the wildest enthusiast builds but also welcomes beginners with its ease of use and convenient cable management. Ultimately, our only real issue with the case comes down to the price point. Priced nearly $150 above its predecessor, the C700M at $439 USD is a very expensive case. It's a price we'd expect to include fan control or an independent digital RGB controller. Despite this, the exceptional build quality and premium materials definitely go a long way towards justifying the price. If money isn't an issue and you aren't interested in the behemoth that is Corsair's 1000D, Cooler Master's C700M is the ultimate high-end full tower.